Truss, a Chicago-based commercial real estate (CRE) tech platform, today announced that it has raised a $7.7 million Series A round led by Navitas Capital, with participation from Hyde Park Venture Partners, which also invested in Truss’ seed round. The round also includes debt financing from The PrivateBank. This round brings Truss’ total funding to $9 million. Commercial real estate, just like its private counterpart, used to be a paper-based industry that remained bound to its old ways for longer than necessary. Over the course of the last few years, we’ve seen the launch of a number of platforms that all aim to modernize how landlords manage their holdings and how tenants find their new offices. Truss focuses on making the office search easier for potential tenants who are looking for office space under 10,000 square feet. Among other things, Truss has partnered with Matterport (which also raised more money this week) to bring that company’s 3D tours to its platform. The service is currently available in Chicago and Dallas. Why this focus on smaller spaces? “Office spaces under 10,000 SF represents the underserved, high transaction volume side of the commercial real estate market where the Truss platform can immediately differentiate itself and add value to small and medium businesses,” Tom Smith, the co-founder of Truss, told me earlier this week. Landlords can list their offices on Truss and then use the service to track their listings’ activity throughout the leasing process. Truss verifies potential tenants and provides landlords with immediate feedback after it tours the office with these potential clients. 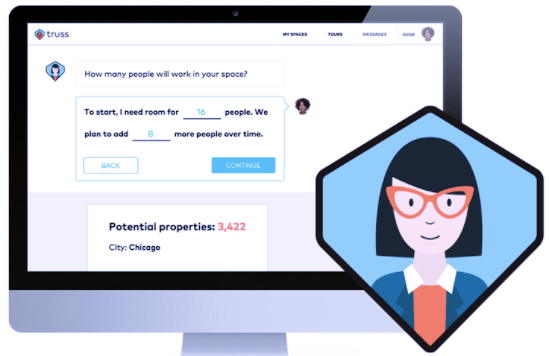 Truss also uses a chatbot to help tenants find the right office spaces for them. Smith tells me that his company plans to use the new funding to add platform support for retail and industrial spaces and to continue the development of its AI assistant. Truss also plans to expand to Houston, Austin and San Antonio soon, followed by other cities on the East and West coasts.